The RFA-Tech Sheartech System offers a CARES Approved method of providing punching shear reinforcement around column heads. The system is fast to install with all component parts prefabricated to allow simple and accurate placement. The Sheartech system has been independently tested, approved and certified by CARES to be fully compliant with the EC2 design code whilst being fully compatible with the outgoing BS8110 design code. The Sheartech system comprises of double-headed studs formed from ribbed reinforcing bar; grade B500C to BS4449, with a characteristic yield strength of 500 N/mm². The ends are enlarged by a hot forging process to three times the diameter of the shaft, giving a cross-sectional area ratio of 9:1 between head and shaft, to securely anchor the stud in the slab. Due to the hot forging process the studs retain the inherent strength of the reinforcing steel. RFA-TECH manufacture the double-headed studs in diameters from 10mm to 25mm. A full range of shear stud lengths are available, in 5mm increments to ensure the correct placement of studs and cover in the slab is respected. The Sheartech double-headed studs are supplied to site factory welded to carrier rails at predetermined spacing’s in accordance with the relevant EC2 or BS8110 design standard under a BS EN ISO 9001:2008 Quality Management System. The carrier rails do not carry out any structural function but are used to ensure the correct and accurate placement of the studs. 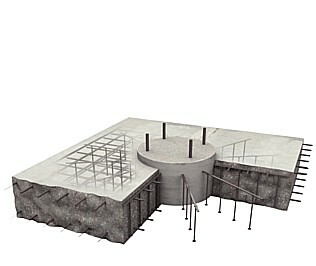 The Sheartech rails are arranged around the column in a calculated and predetermined radial pattern to meet the particular design code specification, the number of studs and rails used being determined by calculations based on the effective depth of the slab. RFA-Tech are also able to offer their own Sheartech Design Calculation Software which can be accessed on the right-hand side of this page. You can register to access the software on our web-site, and then for any future designs simply login with your username and password to produce your design calculations.